Convert MTS/M2TS files from Sony, Canon and Panasonic AVCHD camcorders cameras lossless video quality. 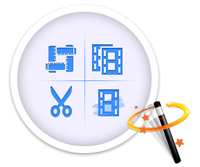 Convert AVCHD/MTS files to videos compatible with tablets , HDTVs, media player etc. 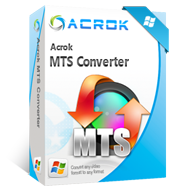 Acrok MTS converter is a software mainly help HD digital camera users to easy convert AVCHD/MTS/M2TS videos on their Windows NT4/2000/2003/XP/Vista/7, and Windows 8/8.1, with it, users can convert HD files to any other video format you want, such as convert AVCHD/MTS/M2TS to MOV, AVI, MP4, M4V, WMV, MKV, MPG, Divx, Xvid, FLV, etc. besides, it also has friendly profiles options to help users easy choose what kind of digital devices to use as, such as convert MTS to iPad Air, iPhone 5S, PlayStation 4, Xbox One, Surface Pro 3, Galaxy Tab Pro, Galaxy S5, Android, Zune and other hundreds of digital devices. For Windows editing software users, you can transcode Sony, Panazsonic, Canon, JVC, etc., AVCHD foramt video to Adobe Premiere Pro, Sony Vegas Pro, Avid, Windows Movie Maker and other mainstream editing programs supported videos via this best MTS file converter. It supports converting M2TS/MTS files to a wide range of video formats including MKV, MOV, AVI, MP4, FLV, WMV, etc. and extract music from videos or convert among audio formats like MP3, OGG, WAV, WMA, AIFF and FLAC. Convert Sony, Panasonic, Canon, JVC footage to Adobe Premiere Pro, Windows Movie Maker, Avid Media Composer, Avid Xpress Pro, Adobe After Effects CS6, Adobe Creative Suite 6, Cyberlink PowerDirector, DaVinci Resolve, Magix Movie Edit Pro, Kdenlive, Keynote, Sony Vegas, etc., best editing video foramt and codec. With this M2TS Converter, it’s very easy to turn your videos to 3D format. It offers up to 4 types of 3D modes including Anaglyph 3D, Side By Side (Half-Width/Full) 3D, Top and Bottom (Half-Height/Full) 3D. Along with the AMD APP and NVIDIA® CUDA™ technology and multi-core CPUs support, you can convert MTS file with super high conversion speed. Output Supported Android tablet/smartphone, Windows tablet, Smart TV/HDTV, HD media player, Apple IOS tablet/phone (iPad Air, iPhone 5S), editing software (Adobe Premiere Pro, Sony Vegas, Windows Movie Maker, Avid Media Composer, Avid Xpress Pro, Adobe After Effects CS6, Adobe Creative Suite 6, Cyberlink PowerDirector, DaVinci Resolve, Magix Movie Edit Pro, Kdenlive, Keynote…), etc.